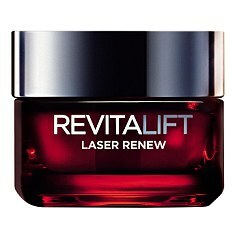 Last week, L’Oreal Paris launched Revitalift Laser X3, a new anti-ageing range with prices starting from just £19.99. The products claim to smooth fine lines and wrinkles as effectively as a £3,000 clinical laser treatment. Asa prezinta Daily Mail crema L'Oreal's Revitalift Laser X3. "I tested Revitalift Laser X3’s Daily Rejuvenating Moisturiser, £19.99, Super Serum, £24.99, and Precision Eye Cream, £19.99, for two weeks and noticed the effects almost immediately. The fine lines at the side of my eyes were instantly softened thanks to the eye cream. After just 24 hours, the serum and moisturiser appeared to have worked together to create smoother skin. The skin cycle — the length of time it takes for our skin to make new proteins such as collagen — is four weeks, so it is remarkable to get such rapid results. What’s more, the products absorb easily and feel light on the skin — no greasiness or oily residue. The star ingredient is Pro-Xylane, derived from plant sugars. It works alongside a special form of hyaluronic acid, a potent moisturiser that is absorbed easily by the skin, and lipohydroxy acid, a gentle exfoliating ingredient that refines the skin surface and stimulates new cell growth. After a month’s use, I’d give Revitalift 9/10. And I think you will, too." da,revitalift,ai incercat? si crema asta ai incercat-o ,despre care zici? puup,noapte buna!